Jim Clark's luck ran out at Monza and he was unable to continue his five-race winning streak, leaving rising star Jackie Stewart to take his first grand prix victory in only his eighth start. 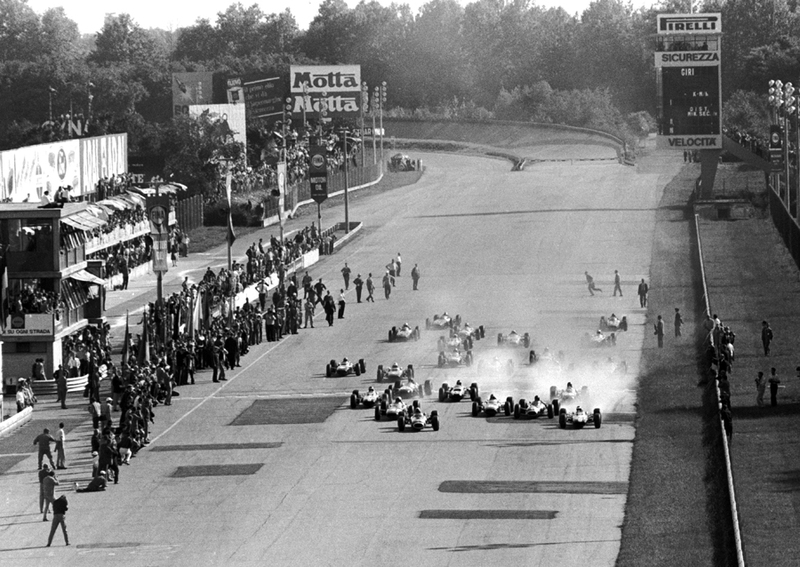 Lying in a picturesque, wooded national park, 10 miles from the centre of Milan, Monza comprised both road and track circuits. The high speed banked loop linked to the road section had not been used in a grand prix since 1961, and once again the race was being run over the shorter 3.5 mile road circuit. On a clear sunny day, Clark started from his familiar position on pole and headed to the first corner wheel to wheel with Stewart and Graham Hill in the BRMs. For lap after lap the lead switched between the three drivers, with John Surtees joining in by squeezing his Ferrari up to first place for three laps. They tore down the pit straight at 150mph, slipstreaming and forcing out every ounce of power to gain that extra yard. The pace was frantic with the lap record going first to Hill and then to Clark. On the 34th lap Surtees dropped out with clutch problems, leaving Dan Gurney, Lorenzo Bandini and Mike Spence chasing after the leading three. With 13 laps to go, Clark's race ended when the fuel pump on his Lotus packed up, leaving Hill and Stewart to battle it out. On the penultimate lap Hill made a mistake as he moved over to give his team-mate more room, putting the wheels on the gravel and losing valuable seconds. This enabled Stewart to take the chequered flag and taste his first victory champagne. The young Scot was delighted with his maiden win, saying afterwards; "I never thought I would get so far this year - I had set out really just to learn my way very carefully."